The Middlesbrough goalkeeper made a couple of top-class saves to keep a clean sheet against Northern Ireland. Randolph and Northern Ireland manager Michael O'Neill after the final whistle. 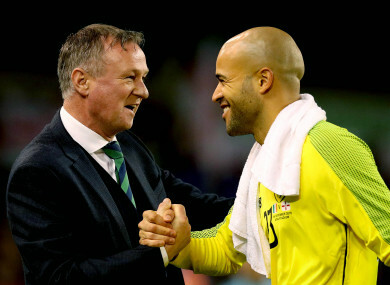 ONE OF THE only positives to come out of last night’s drab 0-0 draw between the Republic of Ireland and Northern Ireland was Darren Randolph’s performance. A commanding display from the Wicklow goalkeeper was the difference in preventing a home defeat for the Boys in Green at the Aviva Stadium as he thwarted the visitors on a number of occasions. Middlesbrough stopper Randolph’s stand-out moments came 14 minutes in, when he kept out Gavin Whyte of Oxford United, and 18 minutes from the end — this time denying Kilmarnock midfielder Jordan Jones with an outstretched toe. Deservedly named man of the match, the 31-year-old was satisfied with his own night’s work even if the team as a whole were once again well below-par. “It was a positive for me and the team, definitely,” Randolph said, before being asked about his saves. “That’s all it was, as simple as that. I just had to try and make myself as big as possible at the last second. Twice it came off today. Ireland have now failed to score in their last three fixtures, and he added: “We’re a bit disappointed that we didn’t kind of do more with the ball and create more chances. It’s stuff to work on. We have positives to take from the game so we’ll move on. Next up is a trip to Aarhus to face Denmark in their final Uefa Nations League game of the current campaign. Having already played the Danes three times in the space of 12 months, the Irish players will know what to expect on Monday night. Email “'They're the nights you want every time you play' - Man of the match Randolph comes to Ireland's rescue ”. Feedback on “'They're the nights you want every time you play' - Man of the match Randolph comes to Ireland's rescue ”.